Roasted Gram / Putnala Pappu is ground into fine powder along with spices. Dosa batter is prepared with urad dal and rice flour. The batter is made into somewhat thin dosa and layered with prepared roasted gram powder. 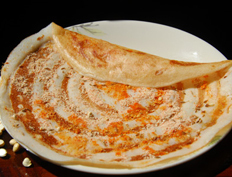 Once the dosa is cooked and is in light golden in color, it is immediately served. Grind roasted gram with red chile powder and salt into fine powder using a spice blender. Pour a ladle full of fermented dosa batter and spread with back of the ladle in circular motion into thin dosa. Layer the dosa with around a tablespoon of the prepared roasted gram powder and cumin seeds. Pour around quarter tsp of oil around the dosa and fry till it turns golden brown in color. Carefully remove the dosa from heat. Alternatively, turn the dosa on other side and cook for few seconds to crisp up a little. Also, store the dosa batter covered in a refrigerator for couple more days. Serve dosa with roasted gram powder with chutney of your choice. Make sure the dosa is made thin else cook on other side. Suggestions: Adjust the roasted gram powder and red chile powder to taste.